Located in Capitola, Mayflower is a family-run Chinese restaurant proudly serving the community since 1989. It's the ideals and principles that guided our family, when we opened our first Chinese Restaurant on Esplanade in Capitola, California. And it's through these ideals and principles that we still live by today. It's being passionate about Chinese foods. Respecting time-honored, time-intensive, and long traditions, without cutting corners with MSG. That means fresh vegetables, meats, and seafood, full of simplicity yet complex in how healthy, tender, and flavorful it can be. It's constantly perfecting our craft. Trying new recipes. Mastering proven techniques, and then bringing that expertise to your table with every meal we serve. It's Eastern hospitality. Being a gracious host, serving generous portions, and putting others' needs first. It's having fun and making sure others do the same. Smiling. Laughing. Meals are best enjoyed in the comfort of happiness. It's being trustworthy and dependable. Consistency is key. We want you to come with a smile and leave with a larger smile every time. It's genuinely caring about our guests and each other. And making sure when people come here for Chinese Food, they feel right at home, just like they have since 1989. Char siu, fried wontons, paper-wrapped chicken, beef teriyaki skewers, fried prawns, and fried egg rolls. Lettuce, peanuts, crispy wonton strips, sesame seeds, and fried chicken drizzled with special sauce. Fried wontons stuffed with cheese and imitation crab. Fried pot stickers stuffed with pork and vegetables. Fried egg rolls stuffed with vegetables. Homemade dumplings served with spicy chili sauce. Sweet red bean paste in a glutinous ball. Healthy and freshly steamed edamame. Spinach, and tofu cooked with vegetable broth. Homemade wontons, char siu, and assorted vegetables cooked in chicken broth. Homemade wontons, char siu, shrimp, chicken, and assorted vegetables cooked in chicken broth. Minced beef, mushrooms, cilantro, and egg whites cooked in chicken broth. Choice of soup with assorted vegetables. Beef, steamed noodles, and mixed vegetables in chicken broth. Chicken, steamed noodles, and mixed vegetables in chicken broth. Chicken, egg whites, snow peas, and seaweed in chicken broth. White meat chicken, bell peppers, carrots, and onions sautéed in brown sauce. White meat chicken, cabbage, carrots, onions, and bamboo shoots cooked and served with Chinese pancakes and Hoisin sauce. Deep-fried white meat chicken served with pineapples and orange sauce. Deep-fried white meat chicken with brown sauce. Deep-fried white meat chicken, bell peppers, onions, pineapples, and carrots cooked with sweet & sour sauce. White meat chicken cooked with bell peppers, and onions sautéed in white sauce. Boneless roasted duck served with Chinese pancakes and Hoisin sauce. White meat chicken and diced vegetables sautéed in garlic white sauce and topped with almonds. White meat chicken and diced vegetables sautéed in garlic white sauce and topped with cashews. White meat chicken, broccoli, carrots, and onions sautéed in garlic brown sauce. White meat chicken, carrots, zucchinis, and white mushrooms sautéed in garlic white sauce. White meat chicken, snow peas, water chestnuts, and carrots sautéed in garlic white sauce. White meat chicken, broccoli, onions, bamboo shoots, and carrots sautéed in garlic brown spicy sauce. White meat chicken, bell peppers, carrots, and onions sautéed in yellow curry. White meat chicken, ginger, and green onions sautéed in garlic white sauce. White meat chicken with diced vegetables sautéed in brown sauce and topped with peanuts. Deep-fried white meat chicken with sweet lemon sauce. Beef, cabbage, bamboo shoots, carrots, and onions cooked and served with Chinese pancakes and Hoisin sauce. Pork, cabbage, bamboo shoots, carrots, and onions cooked and served with Chinese pancakes and Hoisin sauce. Deep fried pork ribs cooked with sweet & sour sauce. Deep fried pork ribs cooked with a special salt mix. Shredded pork, eggplant, bell peppers, and onions sautéed w/ black bean sauce. Shredded pork, broccoli, bamboo shoots, onions, and carrots sautéed with garlic brown spicy sauce. Deep fried pork, bell peppers, onions, and pineapples cooked with sweet & sour sauce. Beef, broccoli, onions, and carrots sautéed in brown sauce. Beef, mushrooms, carrots, and zucchinis sautéed in brown sauce. Beef, snow peas, water chestnuts, and carrots sautéed in brown sauce. Chinese BBQ pork, white mushrooms, zucchinis, and carrots sautéed in brown sauce. Chinese BBQ pork and assorted vegetables sautéed in brown sauce. Beef, ginger, green onions sautéed in brown sauce. Deep fried beef serve with spicy Hunan sauce. Beef, bell pepper, carrots, and yellow onions sautéed in brown sauce. Scallops, ginger, and green onions sautéed in garlic white sauce. Scallops, bell peppers, and onions sautéed in black bean sauce. Scallops, chopped bell peppers, and onions sautéed in tomato based sauce. Shrimp, bell peppers, onions, and black beans sautéed in egg whites and garlic white sauce. Shrimp, snow peas, water chestnuts, and carrots sautéed in garlic white sauce. Sole fish fillet, ginger, and green onions sautéed in garlic white sauce. Shrimp, chopped bell peppers, and onions sautéed in tomato based sauce. Fried shrimp mixed with special honey sauce and served with walnuts. Calamari, bell peppers, and onions sautéed with black bean sauce. Calamari, bell peppers, onions, and carrots sautéed with yellow curry sauce. 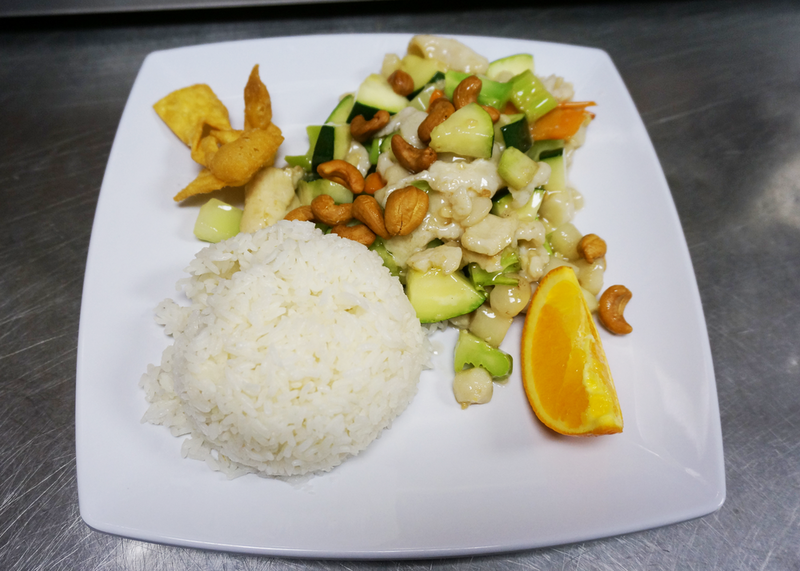 Shrimps and diced vegetables sautéed in garlic white sauce and topped with cashews. Calamari, chopped onions, and bell peppers sautéed in tomato based sauce. Deep fried shrimp served with brown spicy sauce. Shrimp and diced vegetables sautéed with spicy brown sauce. Scallops, shrimps, calamari, baby corn, zucchini, snow peas, white mushrooms, and carrots sautéed in garlic white sauce. Deep fried shrimp cooked with a special salt mix. Shrimp, cabbage, carrots, snow peas, broccoli, white mushrooms, water chestnuts, and baby corn sautéed in garlic white sauce. Cabbage, onions, bamboo shoots, and carrots cooked and served with Chinese pancakes and Hoisin sauce. Snow peas, water chestnuts, and carrots sautéed in garlic white sauce. Fried tofu, bell peppers, onions, pineapples, and carrots served with sweet & sour sauce. Lightly fried eggplants, bamboo shoots, carrots, and onions sautéed in spicy garlic brown sauce. Soft tofu, black mushrooms, snow peas, and carrots sautéed in brown sauce. Soft tofu, white mushrooms, snow peas, and carrots sautéed in garlic white sauce. Bok choy sautéed with black mushrooms and cooked with brown sauce. Broccoli, carrots, and onions sautéed with garlic white sauce and topped with cashews. Broccoli, bamboo shoots, onions, and carrots sautéed with spicy garlic brown sauce. Mixed vegetables and fried tofu sautéed with garlic white sauce. Chinese mustard greens and ginger sautéed with garlic white sauce. Spinach and ginger sautéed with garlic white sauce. String beans, onions, and carrots sautéed in spicy soy sauce. Soft tofu, peas, carrots, and Chinese pickled vegetables sautéed in spicy brown sauce. Beef, white meat chicken, char siu, shrimp, lo mein noodles, cabbage, bean sprouts, and onions. Seafood and vegetables sautéed in garlic white sauce with stir-fried lo mein noodles. Shrimp, lo mein noodles, bean sprouts, cabbage, and onions. Tomatoes, onions, bell peppers, and lo mein noodles sautéed in a tomato base. Stir-fried beef, wide rice noodles, bean sprouts, and onions. Stir-fried white meat chicken, wide rice noodles, bean sprouts, and onions. Char siu, wide rice noodles, bean sprouts, and onions. Wide rice noodles, bean sprouts, onions, broccoli, and cabbage. Pan-fried crispy egg noodles, bean sprout, zucchini, cabbage, and carrots with choice of chicken, pork, beef, or vegetables with brown sauce on top. Stir-fried udon noodles with bean sprouts, and onions with choice of chicken, pork, beef, or vegetables. Thin rice noodles, char siu, shrimp, eggs, bell peppers, onions, and carrots sautéed in curry sauce. Stir-fried broccoli, cabbage, peas, carrots, and egg fried rice. Char siu, peas, carrots, and egg fried rice. Stir-fried beef, peas, carrots, and egg fried rice. White meat chicken, peas, carrots, and egg fried rice. Shrimp, peas, carrots, and egg fried rice. Beef, white meat chicken, char siu, shrimp, peas, carrots, and egg fried rice. Egg fried rice topped with seafood and vegetables. Stir-fried shrimp, char siu, peas, carrots, lettuce, and egg fried rice. White meat chicken, pineapples, peas, carrots, and egg fried rice. Char siu, lo mein noodles, bean sprouts, cabbage, and onions. Stir-fried white meat chicken, lo mein noodles, cabbage, bean sprouts, and onions. Stir-fried beef, lo mein noodles, bean sprouts, cabbage, and onions. Please call (831)476-4688 during our normal business hours for reservations. For large parties and events, a separate party room is available for up to 65 people!